A new concept in Model Railroad Control. 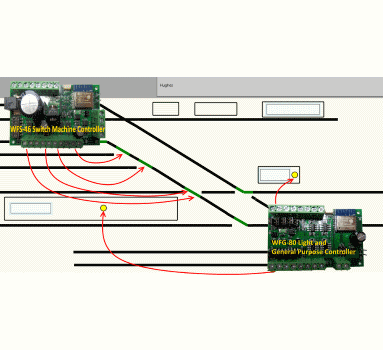 Direct Wi-Fi Control of your Locomotives and Layout . 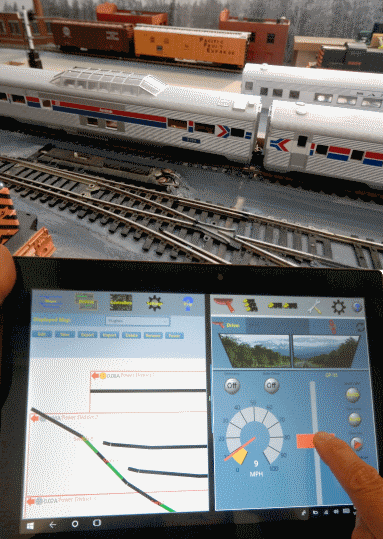 WifiTrax lets you control both your locomotives and your fixed layout features from our Tablet and Smartphone Apps over your home Wi-Fi nework. That means you are free to walk around following your trains without any cable tethers. WifiTrax offers three ways to do this. First there's Wi-Fi Loco. Install one of our Locomotive Controllers in each locomotive to get Wi-Fi cab control using our Loco Operator app for Android or Windows 10. Now there's our new Wi-Fi/DCC. Use your favorite DCC decoder with sound in your loco, install one of our Wi-Fi/DCC Interface Modules and control your DCC Decoder over Wi-Fi from the same smartphone app. If you're using N gauge and can't fit a Wi-F-/DCC module in the loco use Wi-Fi/DCC to the track. Finally there's Wi-Fi DC with a Universal Power Controller on your layout to drive your DC locomotives using Loco Operator. Install our fixed Wifi Controllers around your layout and control switch machines, power districts, lights, signals etc. using our Tower Operator app. Latest News - Our 8-Way Universal Switch Machine Controller is in stock and ships immediately! Use the Tower Operator App to control eight switch machines on your layout just by tapping on a symbol on a map! This switch machine controller can control eight switch machines but don't forget the lower cost 4-Way Universal Switch Machine Controller if you only need to control 4 switches. It works with twin-coil, single coil, stall motor (like Tortoise) and end-switch motor machines. 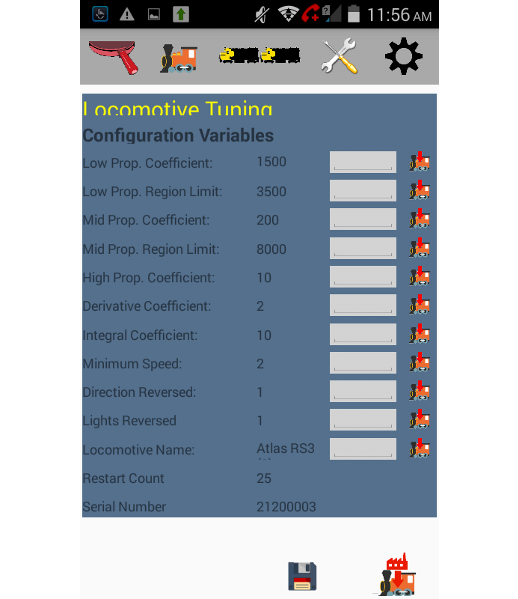 Use the Loco Operator App to control one or two locomotives! 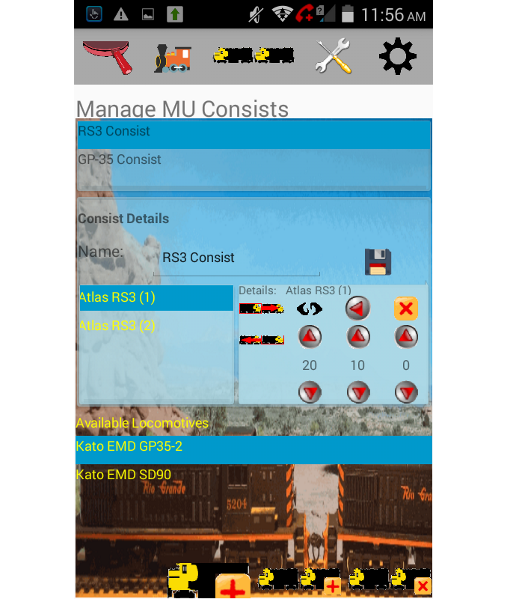 This app runs on Android or Windows 10 and allows your to control two locos fitted with WifiTrax controller modules. Controlling Switches etc. using Wi-Fi Layout Products . 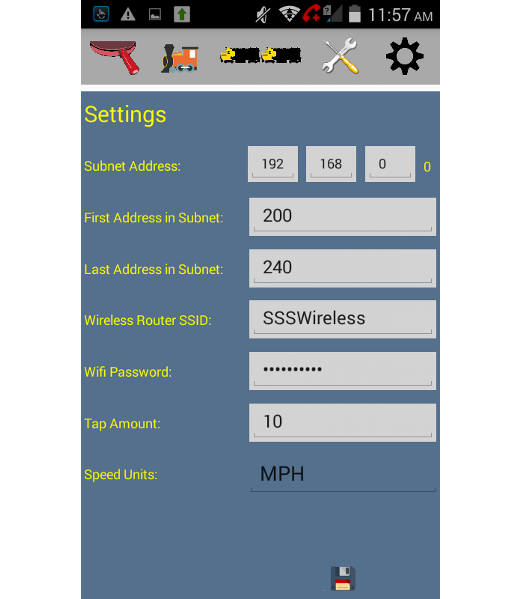 This app runs on Android or Windows 10 and allows your to control switches, lights, signals and power districts. Click to View Details and Buy Now! WFS-46 4-Way Wi-Fi Universal Switch Machine Controller . 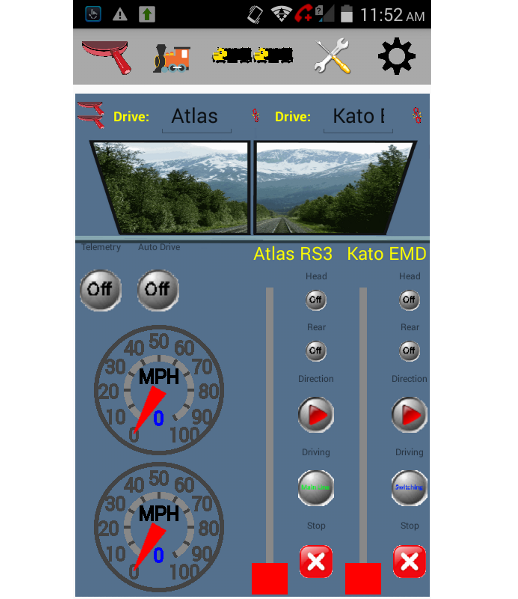 With this module you can use our free Tower Operator App to control four of your model railroad switches by tapping a switch symbol on the custom layout map you build on your Windows 10 or Android computer or tablet. Works with dual coil, single coil or stall-motor switch machines. Only needs DC power, or can use DCC or constant DC power from the track. .
WFS-40 measures 85mm x 50mm (3.35 x 1.97 inch) and mounts under your baseboard or under a building. There are four sets of three screw terminals that are easily wired to your switch machines - either 2 or 3-wire connections. Connect the power terminals to your track or an DC power supply. Up to 25V capacitor charge will drive most dual coil switch machines including spring switches such as Peco. Charge pump circuit generates up to 24V from track power. Compatible with all Switch Machines we Know. .
Mount the WFS-46 anywhere on your layout to control a group of up to four dual-coil, single coil, stall motor or end-switch motor switch machines. 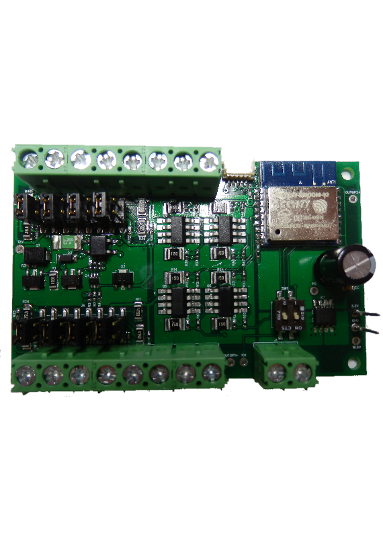 WFG-80 8-Way Wi-Fi Lighting and General Purpose Controller . With this module you can use our free Tower Operator App to control eight LED or filament lamps by tapping a symbol on the custom layout map you build on your Windows 10 or Android computer or tablet. You can control single lights or group the outputs to control 2-Light or 3-Light Signals by tapping the symbol on your layout map. Only needs DC power, or can use DCC or DC power from the track. .
WFG-80 measures 80mm x 50mm (3.15 x 1.97 inch) and mounts under your baseboard or under a building. There are eight sets of two screw terminals that are easily wired to lights. Connect the power terminals to your track or a DC power supply. Dimmable in two banks. Links can select series resistor. Robust design. .
Outputs are arranged in two banks that are dimmable under Wi-Fi control - so you can select suitable brightness for 4 at a time. Use links on board to select suitable series resistor. Will withstand accidental short circuits on any one channel. 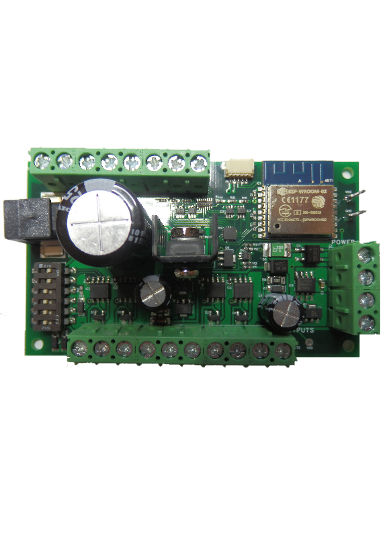 The WFG-80 is a Wi-Fi Light or General Purpose controller. . Suitable for continuous low current applications such as LEDs or low power Incandescent Lamps. Mount it anywhere on your layout to control a group of up to eight lights or other low-current loads. WMH-20 Wi-Fi Loco Controller . 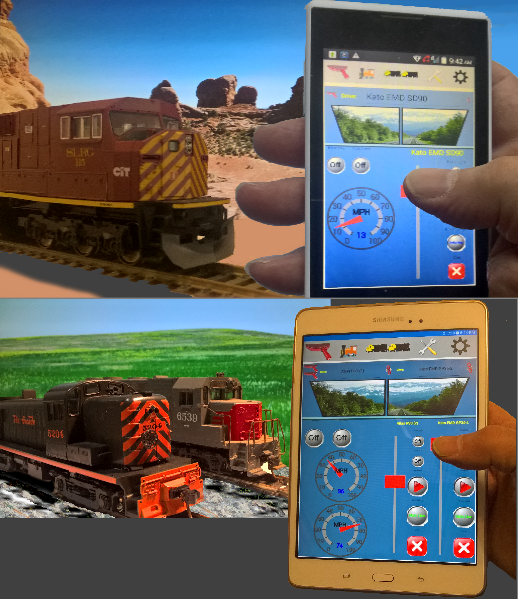 You can install this module in many HO scale locomotives so that you can drive them using our free Loco Operator App installed on your Android or Windows 10 phone, tablet or computer. Suits DCC Ready Locomotive . 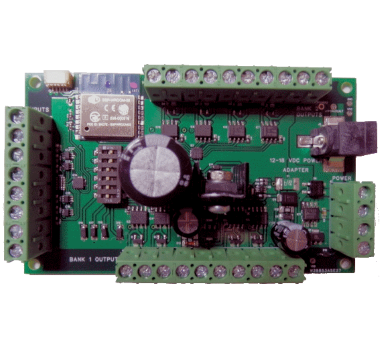 The WMH-20 is a harnessed Wi-Fi Loco Controller with a standard 9-pin JST connector. It measures 18mm x 33.4mm (0.71 x 1.32 inch) and easily fits into most HO Diesel Locomotives. Choose one of our standard harnesses to connect to the 8-pin DCC ready locomotive connector. 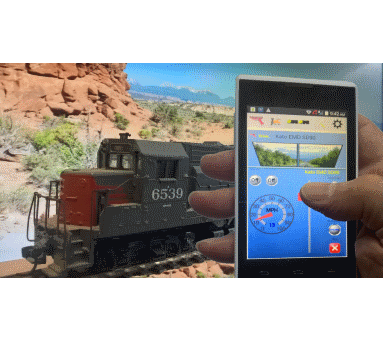 Uses motor back-emf to measure and control locomotive speed. Firmware provides advanced closed-loop control under direction from your hand-held phone or tablet with scale speed available for speedometer. Front and Rear Light Control . Front and rear lights may be turned on or off from your Hand-Held Device. Auto mode turns correct light on as Loco moves. 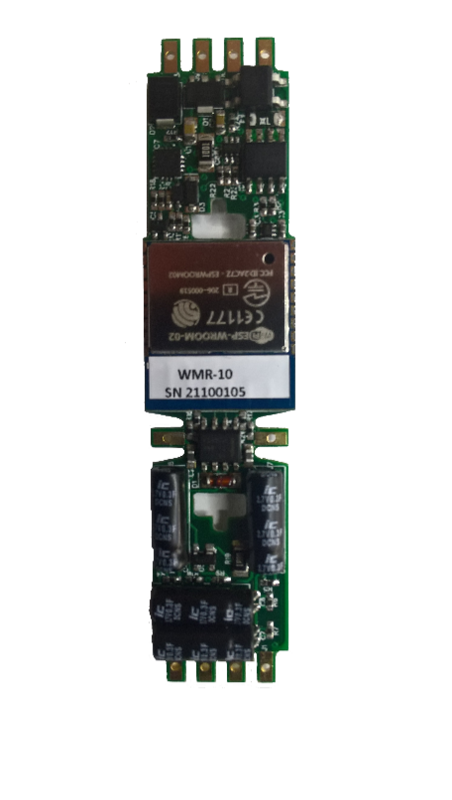 WMR-10 Wi-Fi Loco Controller . 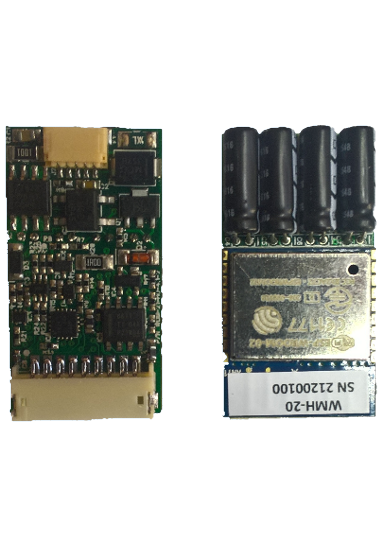 The WMR-10 is a board replacement Wi-Fi Loco Controller that fits many Atlas, Athern and Kato locomotives. It measures 18mm x 76.5mm (0.71 x 3.01 inch) and clips into locomotive replacing the existing board. Wires within the locomotive can be clipped or soldered onto the tabs. 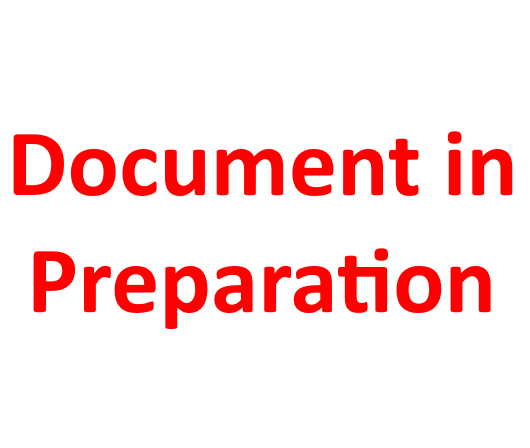 Detailed guidance and a tips for using our products. 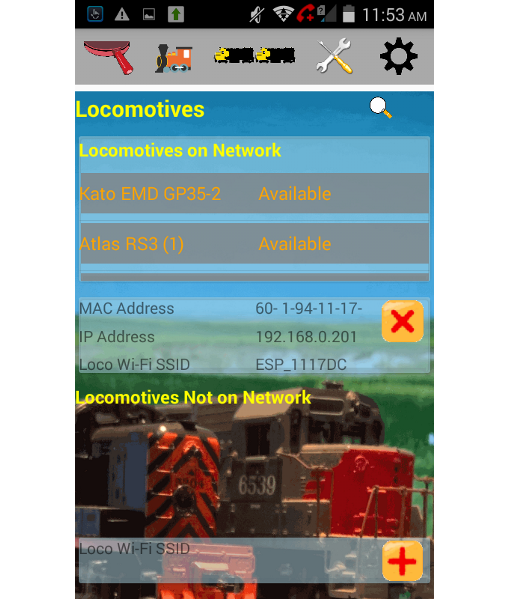 Manage the locomotives on your Wi-Fi network. Create, manage and drive Multi Unit Consists. Tune your locomotive for best performance. WifiTrax is a brand of Model Railroad Control Products, including both board-level electronic modules and software, manufactured by WifiTrax Model Science (An Australian Registered Business). Please see our Contact page for further details.